When you choose one of the best side jobs that fit your interests or gives you great discounts you can do it in addition to your typical 9 to 5 job. Although you need right now is another job, you either don’t have a choice or you’re confused somehow. Also, you may need to supplement your incomes just to survive as the price of everything has gone up. These all may make you mystified to get decided what to do and what right for you in this situation. But, it’s good to know that there are actually many options out there to make some quick extra cash. While some part-time work requires particular skills, although not all of them. So, you can find the perfect side work for you with some research and some specific goals. 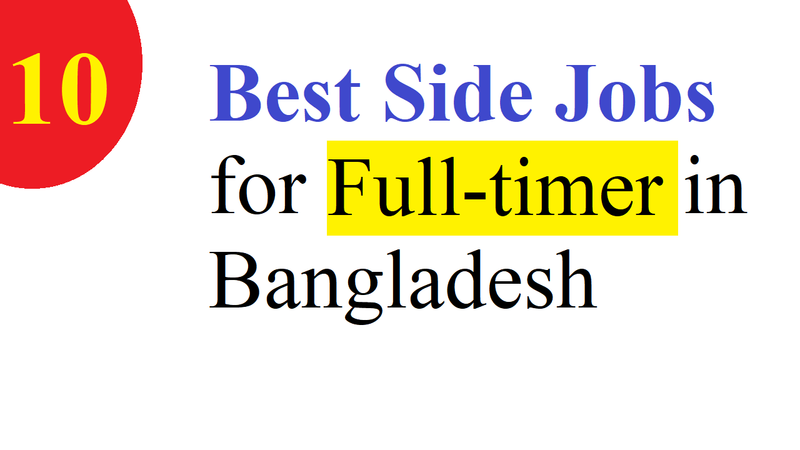 What are the Best Side Jobs for Full-timer in Bangladesh? As it’s important to build your savings from the best side jobs, you need to pick up a side job. Especially, it can help if you need to pay off debt. In this case, as you like, you can work as much, or as little. A side job offers you not only boost your earnings but provides new skills to bolster your resume. From traditional positions like pet sitting or child care to new types of flexible work, there are many different ways to make money on the side. So, when you’re in need of some extra income, you can consider these 10 best side jobs for full-timer in Bangladesh. There are openings for drivers in all the cities where ride sharing is acceptable if you have a reliable vehicle and know your way around town. Among the other options, you can deliver packages to the big companies. So, if you use your car to earn cash then you’ll be able to work a flexible schedule. For example, you have chances likely to be hired by different companies in big cities, such as Dhaka, Chittagong, Rajshahi, and Khulna etc. So, when you want to work for rideshare or delivery driver, check company websites for information. This is not only the best side jobs in Bangladesh but earn some more money. You could freelance to help boost your bank account if you’ve got the right skills and the time. And even at the time when your paycheck isn’t cutting it. In this case, you can think about freelancing full-time. And some side gigs is a good way to see when a transition to self-employment makes sense. So, you have to identify your skills before getting into any freelance marketplace. Also, it’s important to get some necessary training if you’re in lack of any skill. You don’t have to commit to a regular schedule, which is one of the benefits of working for a caterer. And when you’re available, you can work events. Also, if they are hiring then check with local caterers to see. That’s why this is as the best side jobs in Bangladesh as earn some more money. If you want to start teaching job as one of the best side jobs then you don’t have to have an advanced college degree. Usually, peoples like to hire college students to teach their child about primary or high school. But, a bachelor’s degree in a subject area can help you line up tutoring jobs for after school, evenings, and weekends for older candidates. For this job, you can fix posters on the walls that are near to the schools. There are a regular basis weekly Farmers Markets and some Flea Markets. You can work there regularly and earn some money to lead your life smoothly. Signing up for a job at the market can provide some additional income if you’re available weekends. Here you have options to get a deal on produce and the other items that are being sold. Check the calendar for upcoming festivals, concerts, and fairs when you live in a resort area. You can free up some space, downsize your wardrobe, and earn money by selling what you don’t need if you have a closet full of clothes, shoes, bags, and other accessories. For example, to sell those clothes you haven’t worn in forever use one of the online sites enthusiastic about selling used clothes or use an app like OLX or Bikroy, Daraz. You may be able to participate in a paid research study or online focus groups depending on where you live. Also, there are some ongoing where some others pay by the hour or pay a flat rate for your time. You need participating in-person for some positions. And as others can be done online, search Google for “research studies” to find opportunities in your area. This is one of the best side jobs you can easily start doing if you have a skill for planning parties. If you offer your services to everyone you know then you’ll soon have a list of clients who can attest to your abilities. As you build your experience, you can start small with events like kids birthday parties and expand. There is plenty of seasonal work when the economic nosedive is happening at a time. Especially, during the holiday season, retailers always need help. And many local businesses in college towns might need help since students often go home during the holidays. During the holiday season, the giant distributors hire additional drivers. So, there are plenty of best side jobs in this season. Besides, they are as demanding as earnable. It’s the area that’s booming right now. Work still needs to be done and companies are finding it cheaper to hire part-time contractors even with massive layoffs. And you will often make a higher hourly rate with contract work. Also, maybe you can write software documentation for Oracle or do graphic designs work for a local non-profit, think about places that specialize in what you can do. That’s why this is as the best side jobs in Bangladesh as earn some more money.